South KoreaвАЩs LS Cable & System announced on Tuesday it has unveiled product innovations including the worldвАЩs thinnest 500㎸ power transmission cable at CIGRE 2018 in Paris, France to address customersвАЩ needs to adapt to a more productive and decarbonized energy landscape in Europe. Founded in 1921, CIGRE (Conseil International des Grands Reseaux Electriques) is an international non-profit association for promoting collaboration with experts from 1,100 companies, universities and labs in 92 counties by sharing knowledge to improve electric power systems. LS Cable & SystemвАЩs new ground power cable is capable of carrying 500㎸ electricity, the highest voltage among the commercial products available now. The cable features a 5 percent smaller diameter to improve efficiency in production and handling. 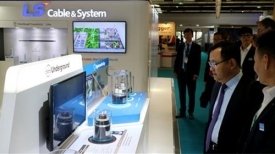 During the exhibition, the company also introduced its undersea cable lineup and HVDC cable, which draws attention as a key solution for realizing a supergrid for North East Asian countries. A high-voltage, direct current (HVDC) electric power transmission system, which uses direct current for the bulk transmission of electrical power, transmits large quantities of electric power with minimal loss over long distances.